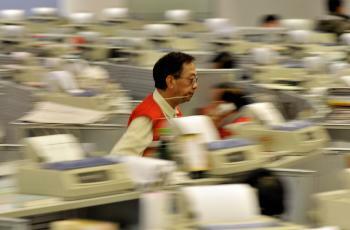 BEIJING (Reuters, Simon Rabinovitch) – A computer glitch at the Industrial and Commercial Bank of China (1398.HK) gave gold traders a 23-minute bonanza that cost the bank dearly last week, sparking a debate on Monday as the bank reclaimed the windfall. ICBC, the world's biggest bank by market value, was left red-faced after its trading system went awry in the early hours of Friday, quoting a bid price for gold of 848 yuan per gram, nearly six times the going rate it had offered moment earlier. Clearwisdom.net (Eye witness accounts) – Many Falun Dafa practitioners detained in the No.1 Team in Heilongjiang Province Suihua Forced Labor Camp are being tortured by a variety of cruel and inhumane ways. Some practitioners were hung from a wall while handcuffed behind their backs, and their heads were covered with plastic bags. They were also burned, force-fed mustard oil, and had cold water poured over their heads. They were forced to sit still on an iron chair and their fingers were burned with cigarettes. Bamboo sticks were shoved under their fingernails, and they were shocked with electric batons and were beaten with rubber sticks. They were kicked, punched, and slapped in the face, forced to stand for a very long time, deprived of sleep, forced to do continuous hard labor, were not allowed to buy food or daily necessaries from a store inside the camp, or to use the bathroom. BEIJING (AFP) – A 5.0-magnitude earthquake struck southwest China on Monday, shaking a wide area that was heavily damaged in this year's Sichuan disaster, officials and residents said. The tremor came as China's President Hu Jintao visited neighbouring areas in Sichuan hit by the devastating May earthquake. BEIJING (AP) — Four people went on trial Monday in connection with China's tainted milk scandal. Hearings were held in the northern city of Shijiazhuang, where the company at the heart of the scandal — Sanlu Group Co. — is headquartered, according to state broadcaster CCTV and the Xinhua News Agency. The first trials in the case began for six men on Friday. All 10 on trial have been charged with producing and selling melamine. BEIJING (The Times of India) – Three former executives of the state-owned Yunnan Copper Group, China's third-largest copper producer, were sentenced on Monday for bribery and embezzlement, with one receiving the death penalty, Xinhua news agency said. LAHORE (The Pakistan Link) – India has received intelligence inputs saying that China has secretly resumed assistance to Pakistan’s civilian nuclear programme, according to the Hindustan Times, which has also claimed that the report has been “corroborated by Western intelligence agencies”. BEIJING (The Associated Press) – Top brass from the Chinese and Russian armies hailed closer ties in their first-ever conversation Monday over a newly installed military hot line, state media reported Monday. San Francisco Chronicle – The United States imports most of its honey and for years China was the biggest supplier. But in 1997, a contagious bacterial epidemic raced through hundreds of thousands of Chinese hives, infecting bee larvaeand slashing the country's honey production by two-thirds. Chinese beekeepers have been using chloramphenicol, an inexpensive and highly toxic antibiotic that is illegal in food production in the U.S.
BEIJING (Reuters) – More than 1,500 boxes of Chinese biscuits exported to Hong Kong and Singapore have tested positive for melamine as suspects in the protracted tainted-food scandal go on trial in China, local media reported on Tuesday. CHENGDU, China (Reuters) – The biggest migration in human history has gone into reverse. China's ocean of blue-collar workers is streaming back to the country's farming hinterland, bringing thwarted aspirations and rising discontent in tow as their city jobs, their paths out of poverty, fall victim to the global economic crisis. TAIPEI, Taiwan (NTDTV, Ben Hedges) – Over the past few years many in the economic sphere have spoken enthusiastically about China's booming economy, yet for Taiwan it may not be the sweet honey that others see on the surface. An organization called the Taiwan Think Tank held a meeting in Taipei over the weekend to assess the merits and dangers of investing in mainland China. The title of the forum can be translated as: Eating Honey or Dancing on the Razor’s Edge. Ex-president of the Taiwan Council for Economic Planning and Development, Chen Bozhi, voiced his concerns over how much of its GDP Taiwan is investing in mainland China compared to other countries, and about concerns of over reliance on exports to China. BEIJING (AFP) – Two more suspects in China's tainted milk scandal went on trial Tuesday, bringing to 17 the number who have faced court in high-profile proceedings over the nation's worst food safety case in years. HONG KONG (International Herald Tribune, Mark McDonald) – It has become one of the New Year traditions in the New China: a stern, old-school warning from the Communist Party about corruption. The warning this year focuses on illegal business deals, and it is hardly a coincidence that the state-run news media are now full of stories about public officials brought low by shady schemes. BEIJING (UPI) – China says it will unveil its first state action plan on human rights early next year, a senior government official said Tuesday. Beijing has long been criticized for human rights abuses, including alleged mistreatment of rural workers, state censorship of the media, crackdowns on political dissent, capital punishment and the suppression of human rights in Tibet. NPR, Morning Edition (Luisa Lim) – In China, the ivory towers are abuzz with a debate over academic freedom and student treachery. The most recent controversy began late last month when officials at East China University of Political Science and Law in Shanghai called professor Yang Shiqun in for a meeting. According to Yang, he was told some students had reported him to the local police and the city education committee for talking about the outlawed Falun Gong sect in class. Yang denied he had ever mentioned Falun Gong, or a document critical of the Communist Party called the Nine Commentaries. BEIJING (Reuters) – The global financial crisis, which has dented endowments at the top universities in the West, has also reduced funding to China's universities, said the president of one of the country's most prestigious schools. NPR, Morning Edition (Anthony Kuhn) – China is worried about unemployment. Recent college graduates are among the hardest hit. More Chinese are attending universities than ever, but now, there are more college graduates than jobs. SHANGHAI (Associated Press) – China Eastern Airlines plans to raise 7 billion yuan ($1 billion) from selling shares to its state-owned parent company — more than double the amount originally planned — to help it weather a financial crisis. Bloomberg (Zhang Shidong) – China's stock index dropped for a seventh day, completing its longest losing stretch in six months. Tangshan Iron & Steel Co. slumped as trading resumed after a four-month suspension. BEIJING (The Christian Science Monitor) – China's dispatch of two warships to help battle Somalian pirates has drawn an ambivalent global reaction – a sign of the decidedly mixed feelings toward its bid for big-power status. The United States frets about how a bulked-up Chinese Navy might complicate a Taiwan conflict scenario. But it welcomed the decision to join a multinational naval "posse" battling Somalian brigands, who have turned waters off east Africa into a hazardous pirates' alley and wreaked havoc on world trade. Still, some of China's Asian neighbors have expressed concern about its naval muscle-flexing.